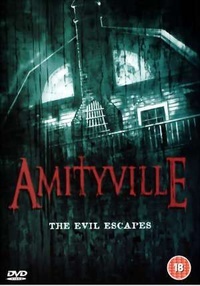 Amityville 4: The Evil Escapes (or simply Amityville: The Evil Escapes; the onscreen title is Amityville Horror: The Evil Escapes) was released in 1989 as a television film by NBC. It is the fourth installment in the Amityville saga. It was released on home video by Vidmark Entertainment, then released on DVD twice by Allumination Filmworks in 2003 and 2007. This was the only Amityville sequel to be based on a book in the main book series. Amityville: The Horror Returns was also going to air on NBC but the film was never made. This webpage uses material from the Wikipedia article "Amityville_4%3A_The_Evil_Escapes" and is licensed under the GNU Free Documentation License. Reality TV World is not responsible for any errors or omissions the Wikipedia article may contain.